These Whole Spring Removing Pliers are used for gripping and removing springs. The jaws of these pliers are cut away to reach around posts while still maintaining a firm grip on the spring. The jaws are not hardened which will allow them to conform to the spring surface giving a more secure grip on the spring. The long handles allow for extra leverage for stubborn springs. 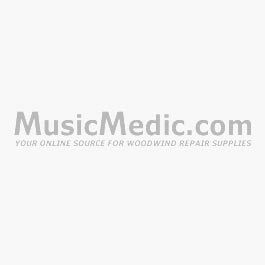 These pliers work well for all woodwind instruments. 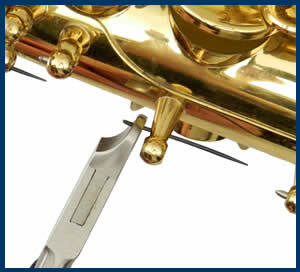 You can use these with smaller woodwinds in areas where traditional spring removing pliers cannot easily fit. 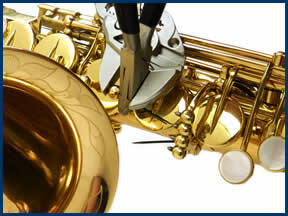 1.Remove the key from the instrument. 2.Firmly grasp the spring with the Whole Spring Removing Pliers several millimeters from the face of the post. 3.Using a second pair of pliers, such as the Knipex parallel jaw pliers, place one jaw on the back of the post head and the other on the far side of the Whole Spring Removing Pliers and squeeze firmly. 4.Once the spring is loosened from the post, use the Whole Spring Removing Pliers to grip the spring on the other side of the post and remove.